*MUST CREDIT* Ivon Bartholomew and Emma Lawson to their pictures. 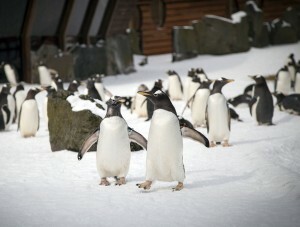 Penguins at Edinburgh Zoo look around their revamped enclosure, Penguin Rock. Penguins at Edinburgh Zoo have been testing the fun new features in their renovated enclosure. ‘Penguins Rock’, which opens to the public tomorrow (March 14), has been given a £750,000 facelift and now features mock sandy beaches, a waterfall, diving board and slide for its cute inhabitants. Head of Living Collections at Edinburgh Zoo, Darren McGarry said: “Our penguins have been reintroduced back into their home over the last few weeks, with the 28 gentoos and 27 rockhoppers that remained at Edinburgh Zoo going in first. “Next, a week later, came gentoo birds that had been staying in Belfast and Denmark and there was lots of calling out as birds definitely recognised old friends.